Students gather at a debate watch party sponsored by NU Votes, the Political Union, and the Roosevelt Institute at Harris Hall on Wednesday. The watch party was held after NU Votes spent the day registering students to vote. 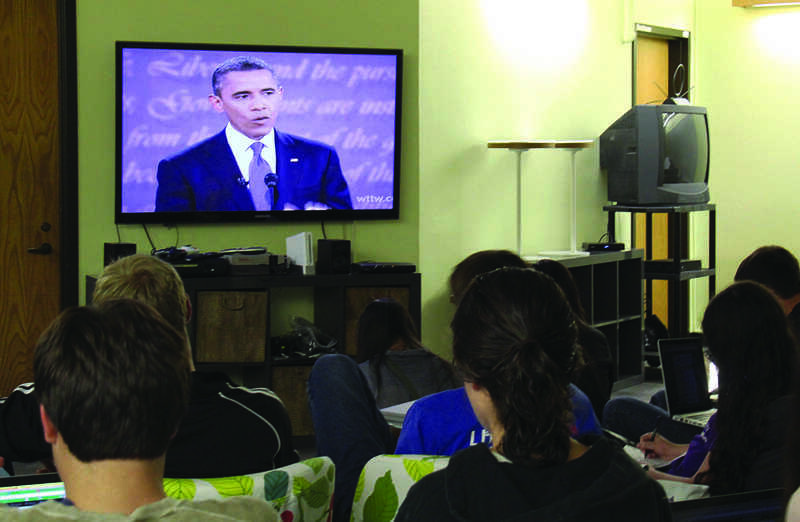 More than 60 million Americans tuned in for the presidential debate Wednesday night, and 80 of those viewers gathered in the Communications Residential College for a watch party and discussion, cupcakes in hand. “What I hoped for in the discussion is for all of the students to realize your ideas are as good as the talking heads and pundits,” Zarefsky said. Roger Boye, the CRC master, said he was encouraged by the high turnout. Students sat on the floor and some stood when chairs ran out during the 90-minute debate. Communication sophomore Christopher Romero, a CRC resident who is taking Zarefsky’s tutorial, said he thought there was not a clear winner of the debate. In the class, he said he learned more about the historical context of debates, which have not always been a staple of elections. “There were important social issues that weren’t addressed, such as women’s rights, abortion and gay marriage,” he said. Zarefsky emphasized during the discussion that debates do not necessarily sway voters’ opinions, and that it may be impossible — or perhaps unimportant — to determine a winner. He asked the group to consider how the debate format affects the candidates’ responses, tone and body language. In a possible nod to the students’ political leanings, those in attendance quickly finished one of the three boxes of Sprinkles Cupcakes, decorated with blue donkeys, leaving some other cupcake boxes with red elephants untouched. Several members of the Medill Board of Advisers, including David Louie (BSJ ’72), attended the event. They are in town for a meeting tomorrow. On Tuesday, Boye said the International Studies Residential College, Jones Residential College and 1835 Hinman will come together for the vice-presidential debate. CRC will also host a viewing party with a faculty-led discussion for the town-hall-style presidential debate, on Oct. 16, and Zarefsky will oversee the final presidential debate, on Oct. 22, at CRC.